End of Game : (Change) If nobody wins before the end of the game, the winning player is the one who moved the most playing figures out of the fortress. If players tie, the player who first reached this number is the winner. 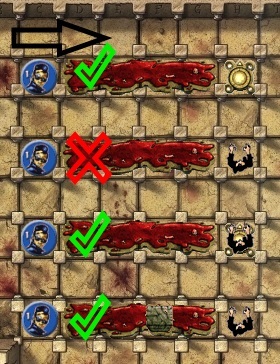 (Change) A playing figure is allowed to end its movement on a blood pool. 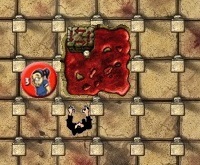 (Change) A playing figure or a stone who is pushed and slides freely on a blood pool is not crushed against a wall. (Reminder) A monster cannot push a turning stone, even if the turning stone is on a blood pool. 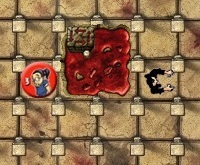 (Reminder) A monster doesn't spend a movement point when bumping into a turning stone on a blood pool, and doesn't look to the left and right. ©2003 2F-Spiele, Finstere Flure is a game by Friedemann Friese.